“Where did you learn to garden?” inquires a childhood friend. She watches as I create a garden container. The growing season in Butte, MT is July and August — time enough for only the hardiest of plants to grow. It wasn’t until I went to college in Kansas that I experienced the spectacular season of Spring. I didn’t have gardens in Washington, DC or New York City. My schedule and location didn’t allow it. I appreciated others efforts — the Tidal Basin’s cherry blossoms and the tulips strips that brightened Park Avenue. 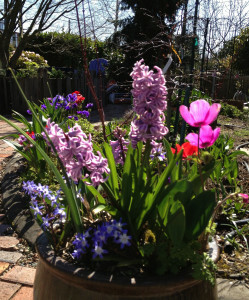 (c) Jeanette Murphy 2013Container of Spring flowers — purple hyacinth, pink anemones and others. Background of early Spring garden yet to bloom. Seattle! The pleasant seasons keep roots deepening. Some plants have both spring and autumnal blossoms. The process of planting and tending renews my awareness of life. Yes, it is Seattle where I round the corner on a walk to see boulevard of delicate cherry blossoms. The tougher tulips hold their ground until after the crocus, anemone and hyacinth introduce color and fragrance back into Spring. The two hundred bulbs are growing — April’s tulips will inspire oooos and aws! Seattle! Yes, is it Seattle…where I learned that gardens are a work-in-progress. The tending this season will make next year even more spectacular. Proof that effort encourages life to expand as the garden matures. The rainy transition between Winter and Spring prepares the garden beds. Amended soil at the ready when earth is warm and seedlings have developed roots. The early days of tender growth when the sunshine forces the smiles as we squint to see the sprouting flowers, young shoots of vegetables and blossoms of fruit. Ah yes, It is Seattle. This entry was posted in JEANETTE and tagged butte, garden, seattle, spring by 4drlegacy. Bookmark the permalink.